The cigarette machine is semi-automated principle (loading buy the operator) and convince for leaf or precut tobacco as per the following description. The equipment described herein is engineered to feed tubes into the indexing mechanism and tobacco (leave or pre-cut) into the hopper. The injection mechanism properly fill tobacco inside the tubes in a free standing machine operated by a single operator. The target rate for the production machine is 50 tubes per minute. Production is 3000 cigarettes per hour or 72,000 per day on ideal working condition. If the customers want to test various cuts or specifications of their tobacco i.e. various grades of fine cut and their preferred range of tubes Défis could make tests for there customers. The existing standard tubes diameter used by our machine is 8 mm by 84 mm length, and is made with a resistant paper selected to support the insertion of tobacco through the end of an open preformed tube, with mechanical clamping. Other types of tubes could fit on the machine, but this requires a new tooling or adjustment if there is a substantial difference between the tubes and filters. Generally, the set-up time would be only 4-5 minutes between two different families of parts, if necessary to convert the machine. All new specifications, (special tobacco, light duty tubes etc…) on the production machine will take 1 day for set up and testing. At the end of this period we will know the limits of the production machine as a consequence of the new specifications. No waste at the outside of the equipment with the product. The main electric control panel centralizes all functions of the system and includes the PLC integrated into the touch screen panel, fuses, relays, terminals, drives, selector (mode manual/automatic or step mode). Control panel and all cabling conform to the CSA and UL or CE norms (on demand). Ethernet connection is available if customer request control of his production from outside or his office. The operator control panel with an error message, light indicator, red when the machine is out of service and green when the machine is in operation, start/stop buttons and emergency stop button, error message indicator, production record, maintenance program. The cutting mechanism will be by rotor blade system do not requested adjustment and is low maintenance. Each cycle of machine could be pre-programmed for 20, 50, 100 cigarettes. Special and confidential Customer agreement should be sign prior to starting production. All contracts are strictly confidential. Mechanical: All surfaces in contact with the tobacco and tubes products are in stainless steel. Special emphasis is placed on maintenance accessibility, easy replacement of wearable parts and simple operation. 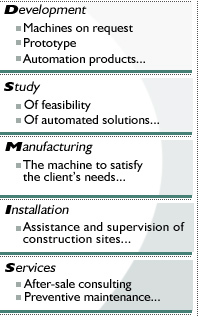 Construction is as per Defis and Customer specifications. All parts used on this machine will strictly approve by certificate document to injure the respect of quality. Following materials are never permitted on the machine: urethane, Styrene, Teflon, and PVC. Electrical: 120 volts VAC, 60 hertz, 1 phase, 15 amps. Others voltages are available upon request and will require the appropriate transformer. All wiring and components comply with basic NEC requirements. Construction is as per Defis specifications. Paint: Defis standard color for all painted surfaces is green/grey.